We always advice our customers to use professional carpet cleaning at least once every six months in order to maintain the healthy appearance and the quality of their carpets. Our experience proves that when carpets are treated correctly, they will last for many years. The team behind London Cleaning House uses the most effective products, techniques and the latest equipment in order to clean your upholstery and carpets. The methodology we use is called hot water extraction and includes top of the shelf products of Prochem (the leader in Carpet Cleaning Equipment). Our team move around all furniture in order to facilitate the access to the carpeted areas. Then we treat the carpet by using spot removers to break up any stains within the carpet. Next is the actual steam cleaning process and it is much like vacuuming. We go over the carpet with the steam cleaner and then extract the moisture which includes all the pre-treatment solutions. As we are using most modern equipment, the powerful carpet cleaning machines will take up to 90% of the moisture. In a few hours you will be able to walk again on the carpet and there is no need to leave it damp for days to dry out. 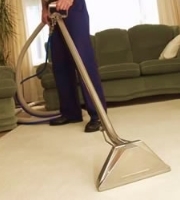 The technique known as hot water extraction or steam cleaning can be used on any type of carpet. The process does not sacrify the effectiveness and quality of your carpet. The high temperature steam, agitation, and pre-treatment sprays combine to prolong the life of your carpet.